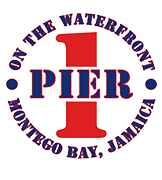 Our Complete Menu » Pier1 Jamaica » Montego Bay's Seafood Restaurant, Bar and unique Entertainment Centre since 1986. The Italian - With garlic-herb oil. Topped with tomatoes, olives & feta cheese. The Reggae - Jerk chicken & bell peppers. With scotch bonnet pepper, capers & onions. Salted codfish. in a tasty, batter, fried golden brown. Served with spicy escoveitch sauce. A Jamaican favorite. Two pan-seared conch cakes with red beet aioli. Conch is seasonal. Substitute Crab Cakes off season. Golden-fried & served with smoked pepper mayonnaise. A twist on our National dish with spicy scotch bonnet-soy dipping sauce. Choice of: Signature Citrus BBQ, Tequila Glaze or Firestick. With pressed green plantain rounds. Crisp lettuce, tomatoes, sweet pepper & shredded carrot. Fresh local mixed greens, feta cheese, almonds & dried cranberries. Quinoa, kale, lettuce, tomato, pumpkin seeds, mushrooms, grilled carrots, dried figs & yam crou-tons. Cajun spiced salmon steak hard-seared & served on a bed of fresh local mixed greens, feta cheese, almonds, dried cranberries & sweet corn salsa. Loaded with shrimp, chunks of lobster, conch, mussels, fish, clams & calamari. NOTE: Lobster & conch are seasonal. Our signature burger topped with crispy bacon, cheddar cheese & our house made BBQ sauce. Sautéed calalloo, sweet pepper, onions, carrots, cabbage & mushrooms in a warm flour tortilla. Cheese is optional. Pier 1’s famous jerk chicken with honey smoked ham, cheddar cheese, crisp lettuce & tomato in a flour tortilla with ranch dressing. Served cold. Thinly sliced beef grilled with onions, mushrooms, sweet peppers, spicy scotch bonnet peppers & melted cheddar cheese. Served on a roasted Italian roll.aThinly sliced beef grilled with onions, sweet pepper, mushrooms & melted cheddar cheese, with a hint of spicy scotch bonnet pepper. Served on a toasted Italian roll. Our famous jerk chicken with spicy jerk sauce, cheddar cheese, lettuce, tomato & fried plan-tain.Served on a toasted Italian roll. Lightly grilled white fish fillet with crisp lettuce, tomato & tartar sauce, on a toasted Italian roll. Layered with Pier 1’s famous jerk chicken, honey smoked ham, cheddar cheese, lettuce & to-mato. Three soft shell tacos with papaya salsa, smoked pepper mayo & fresh red cabbage slaw. Served with spicy black beans. Flaky fish fillets coated in shredded coconut & crisp fried golden brown. Served with a sweet mango-ginger sauce. Flaky white fish fillet pan seared with local seasonings & splashed with Chardonnay. Plump & juicy shrimp battered & coated in shredded coconut & crisp fried golden brown. Served with a sweet & spicy mango-ginger sauce. Plump juicy shrimp slow simmered with local seasonings in a spicy West Indian style curry sauce. Caribbean lobster tail brushed in lime juice & perfectly grilled. Served with drawn garlic butter.A seafood lover’s favourite. Chunks of Caribbean lobster tail sautéed in a garlic-lime butter sauce with a touch of white wine. Served in the shell. Fresh from the sea. Lightly grilled with onion rings & topped with citrus-butter. Ask server for today’s catch. Dusted in spicy creole seasonings & hard seared.Served on a bed of wilted greens with pepper jelly. Choose Escoveitched, Steamed, Brown-Stewed, Fire-Roasted or Stuffed & Steam-Roasted. 1/4 chicken, seasoned in our special jerk herbs, spices & Jamaican scotch bonnet pepper. Juicy grilled chicken breasts bathed in a sweet mango-coconut sauce.A fresh taste of the tropics. Local beef tenderloin, perfectly char-grilled to your liking, with roasted mushrooms, sautéed onions & Bérnaise butter. Served in a cast iron skillet. Seasoned in our special jerk herbs & spices. Slow simmered white beans & tomato mixed with garlic-sautéed greens. Sautéed vegetables in local seasonings & Italian herbs tossed with toasted almonds, parmesan cheese & penne pasta. With sweet carrot, walnuts, cinnamon & nutmeg. Covered in rich chocolate ganache. A Chocolate lovers favorite. Homemade with Bailey’s Irish Cream & loaded with banana, chocolate chips & dried fruit. A taste of the island.